Zoomax offers a myriad of products for individuals with visual impairments. The company offers a full line of low vision products including handheld, portable, and desktop video magnifiers. They now even offer their first wearable: introducing Zoomax Acesight. 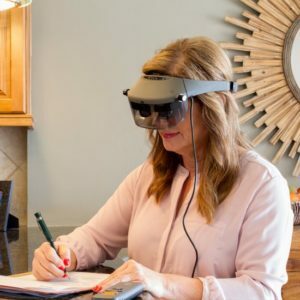 Acesight is a pair of electronic glasses that “enable people with severe low vision to regain their visual independence.” With this lightweight wearable, users are able to enjoy watching TV, reading, playing on the computer, and so much more – all hands-free! Visit Acesight’s website to learn more!